Beetle Ju download. Free download Beetle Ju game. Boulder Dash download. 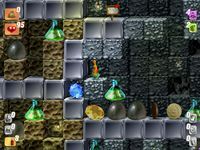 Beetle Ju is a game inspired by old Digger and Boulder Dash hole-digging and stones-falling concept. 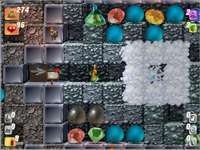 You're playing as a small beetle named Ju (shortening for "Junior") and your aim it to clear your home dungeon flooded with evil and treacherous monsters that appeared from nowhere. Your two basic weapons are rocks and grenades. Destroy monsters by dropping rocks on their heads but be careful! When you dig ground beside the rock, it may slip down and hurt Ju. Grenade is an ordinary spray that explodes and destroys everything around when hit or pressed. Just throw it to a monster or an obstacle or put it on the ground and it will explode when a monster tries to push it. The number of grenades is limited, but you can replenish your stock of weapons by picking up bonuses. When Beetle Ju fights monsters or just wanders along the corridors, he loses his vital energy. He can recuperate by eating berries, watermelons and other delicious things he comes across.